Dennis, you might try contacting Dynojet and ask them where the nearest 250i is installed? This model has the eddy current brake for simulating wind loads and such. Thanks for the suggestion Scotty...................We may have a lead on one in the Milwaukee area. We were at the AMA races at Road America this weekend.............a little race-bike carnage...............minor rider injuries.............a little sun-burn on my head...........and a few good ideas for adding more organization to our pit-equipment. For me it was very interesting and I learnt a bit from it. As I didnt have all the specs of your cam it wont be spot on but scale wise it presents an accurate curve in comparison of two cams. 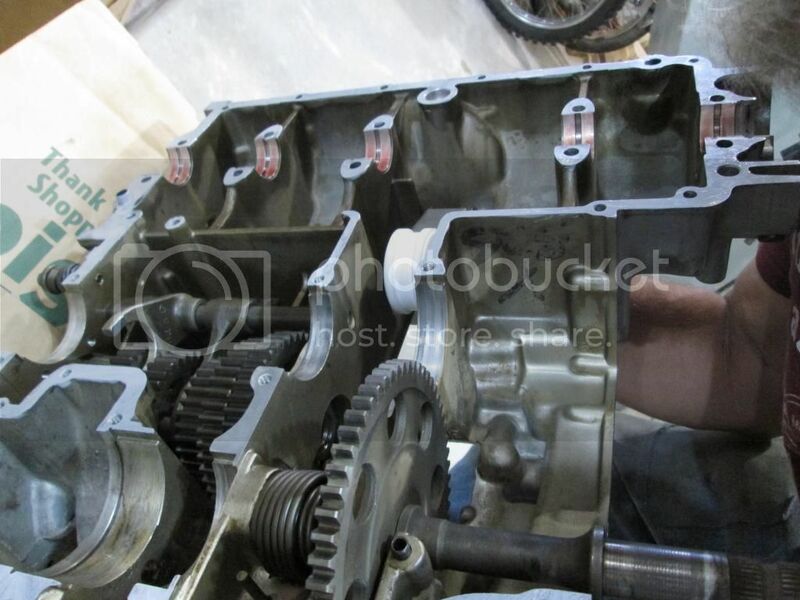 You will notice to things Den, the extra LCL hasnt effected the HP or torque at all, in fact the HP is tad more than 125 / 75 at over 9,500 rpm PLUS the big bonus is you can run more valve and miss things. That is a really good thing, if the 35mm valve and big exhaust help the flow you re on the right track I reckon ! Just to emphasize how head flow effects things I tossed in the HP curve of Mikes ports to compare HP based on so his .400 lift number of 83CFM compared to the demo curve head with 70CFM at .400 lift so an extra 13cfm will net you more power as per the top black graph compared to the 70 cfm lower graphs red and green. So Den if you can get more flow with your big 35mm valve then your cam is just great . Hope you get the flow, its not easy after 70 cfm regardless of the valve size. 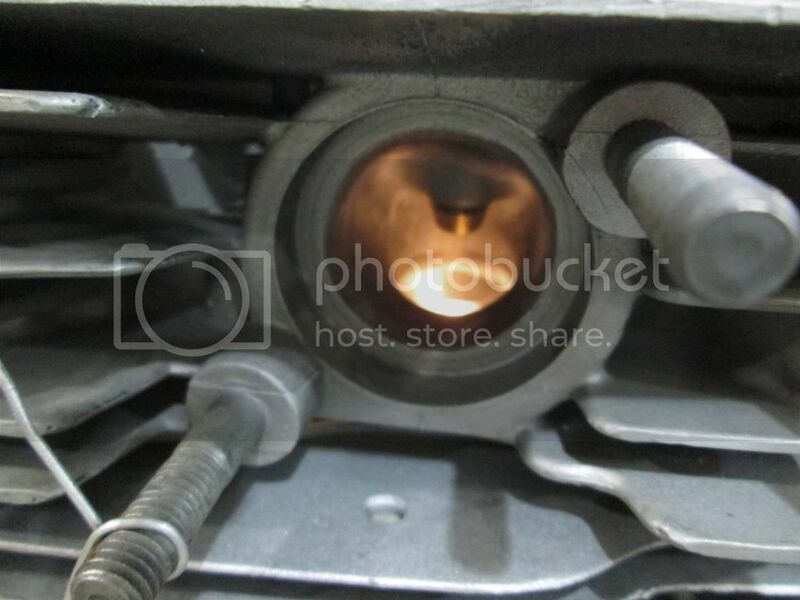 Our intake ports are 33mm in diameter from the carb-slide to the port area at the valve-guide. 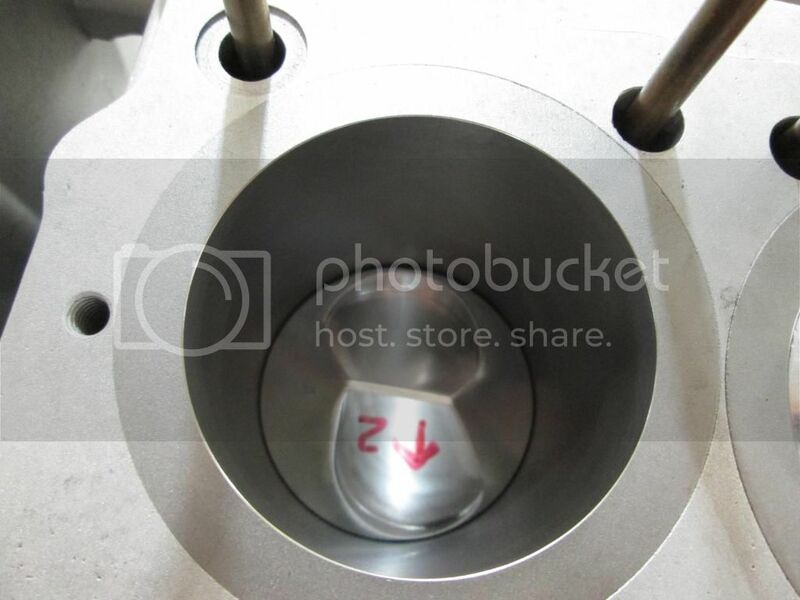 We have a raised roof (pocket) around the guide and the throat is also 33mm at the seat for a 35mm valve. Your chart shows the possibilities for this motor if we can get it to rev above 9000 in top gear. Pre-Registration fees for two bikes in three classes are confirmed.....along with two extra crew-passes. Hotel rooms at the Best Western in Wendover, Utah, are confirmed..............Saturday check-in.........leave on Thursday AM. I have 3 rooms with double queen beds, refrig..........BIG screen TV.........and FREE Breakfast............usually open at 6: AM. Racing begins at 7 so I like to be ready when the air is cool..........more dense........and quiet. No, I'm not paying for your rooms...............but I tend to have ice-cold beer and other beverages in my cooler throughout the week. I can make changes to the rooms but you have to let me know..........Jerry is arriving on Sunday. Who else ($2-Bill; Zak?) and when? I can order extra wrist-band passes at a discount (half-price for all days) if you let me know in the next few days.........Frank? BTW...........logistics............my van can take 5 or 6 passengers so you don't need to get your own vehicle full of salt.............but another vehicle would make it easier to get around while we are waiting in the staging lines. I plan to tech-check both bikes on Saturday, run the Tiger Cub for a record on Sunday, and get a test run in on the 750/4. Then finish with the Tiger Cub Monday AM and begin running the 750/4 for real through Wednesday. The event is open until early Thursday PM if we need to make another attempt. Dave tells me that if this was a single-cylinder motor, it would be very difficult to start. As it is, we may have a low idle speed of 3,000 rpms and I will have to very careful not to 'kill-it' when starting to roll. We have plenty of room between the retainers and the guides at full-lift for the valve seals. To date, the reciprocating mass in each of the valve-trains has been reduced by 6-grams. 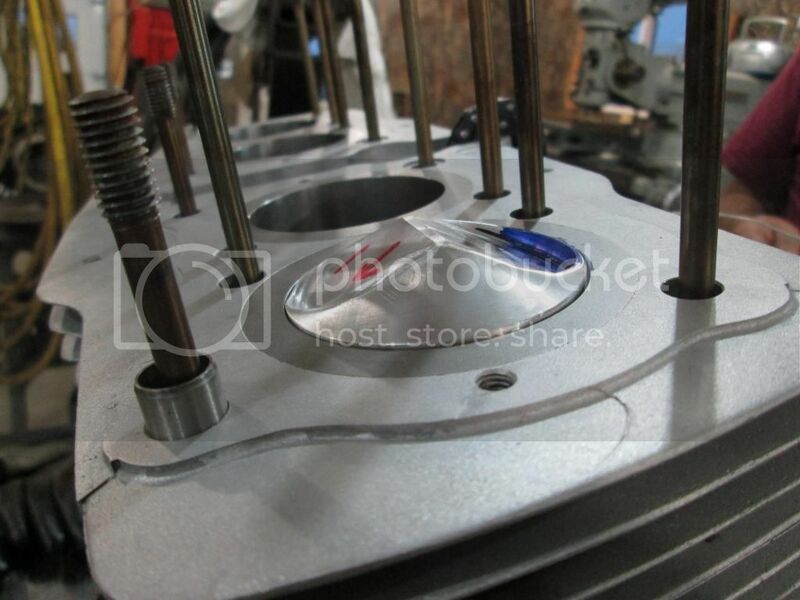 Now its time to dress the pistons and widen the valve-pockets. Then we get to play with head-gasket clearance and do the final adjustments for maximum compression. While waiting for a copper head-gasket, Dave made the clamps for the steering dampner, mounted the custom clip-ons, and reduced the turning radius. 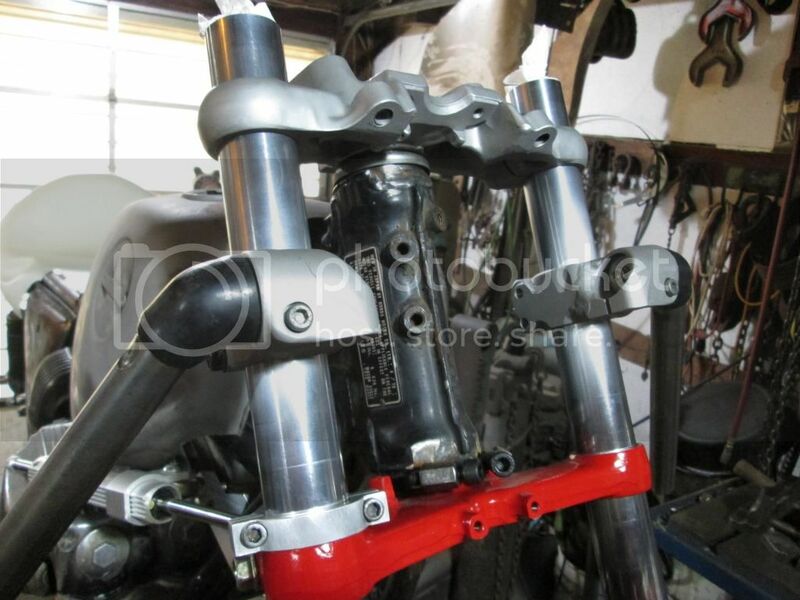 Dave also finished welding the swingarm gussets. 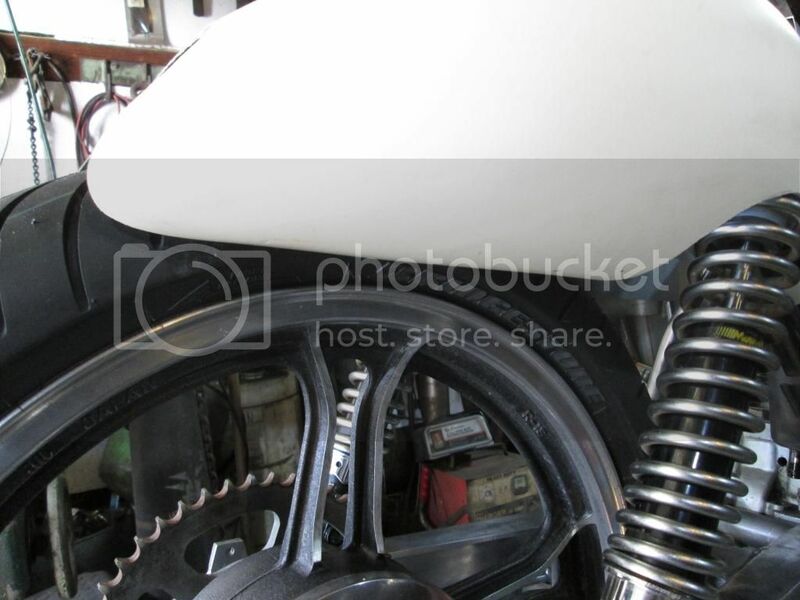 I sat on the bike to measure foot-peg position for custom brackets. 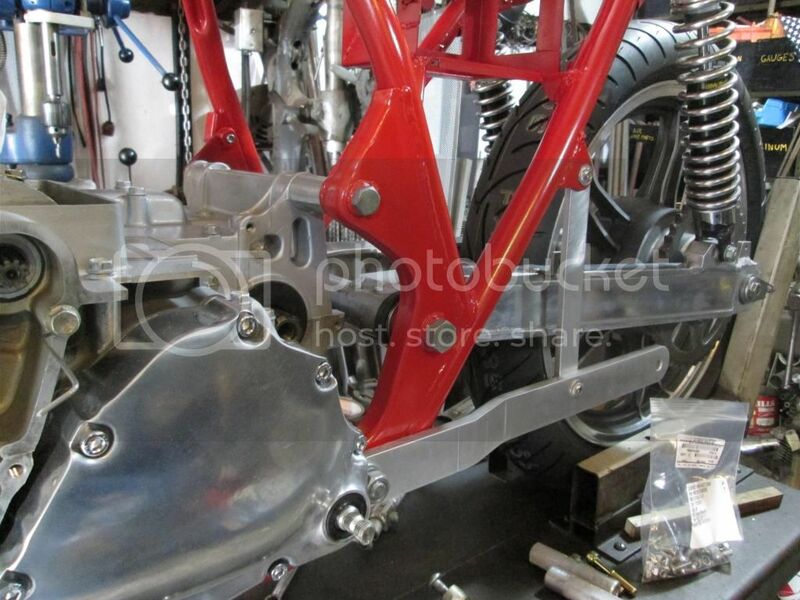 Also trying to fit a rear-brake cable to be operated from the handlebar. That would make it a lot easier to handle the bike when loading and unloading. I'm cleaning wheels and getting ready to mount the tires.........well balanced..........and rotating in the correct direction. We have 5-days to get a few more things accomplished before Dave takes a week of vacation (dual-sport riding in the UP) and I host a few family commitments. We are basically on schedule and hope to be testing the motor in mid-July. Trial gearing will be 16 x 45. 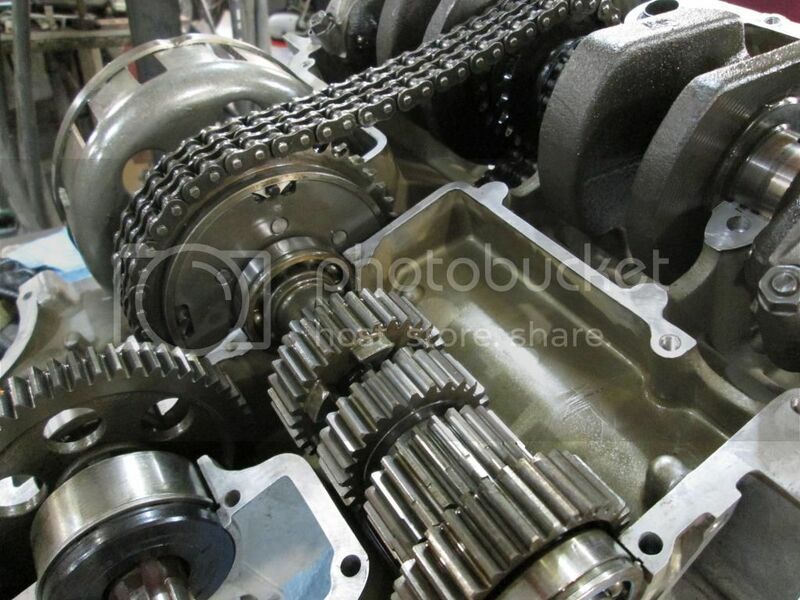 We also have 17 and 18 x 38-43 sprockets available with two 530 chains and several master-links. We then removed the copper head-gasket and re-measured with good results That means we can do our planned mods to increase compression (some secrets, but not to all) and maintain proper valve de-shrouding for good flow characteristics. 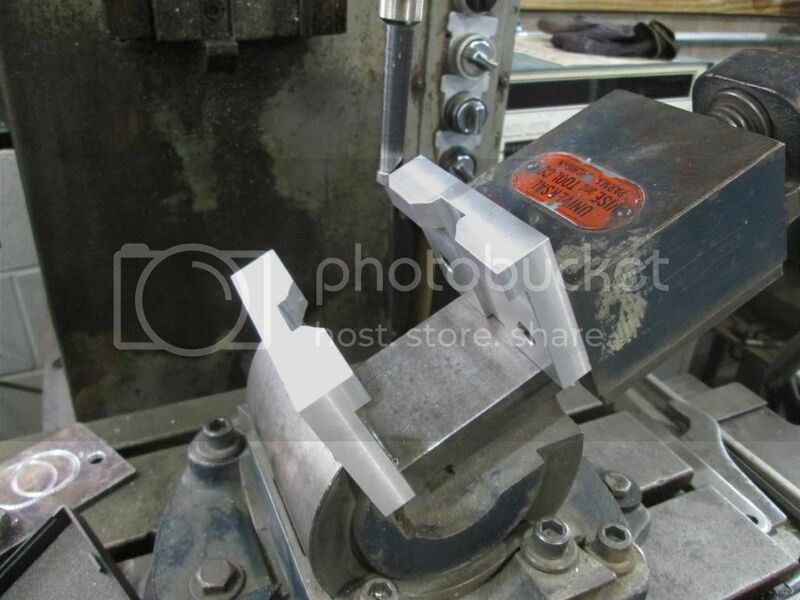 The first pic is of the 'jaws' Dave made up to hold the pistons at the correct angle for the milling machine to trim metal from the edges of the valve pockets.............depth was critical because of maintaining sufficient thickness between the outer-edge of each pocket and the ring-lands. Rocker Adjuster to Valve Stem angle is very good with plenty of swept area............Additional stem-trim and lash-caps to be installed. Looking good Dennis. What studs are those? Not APE anyway. 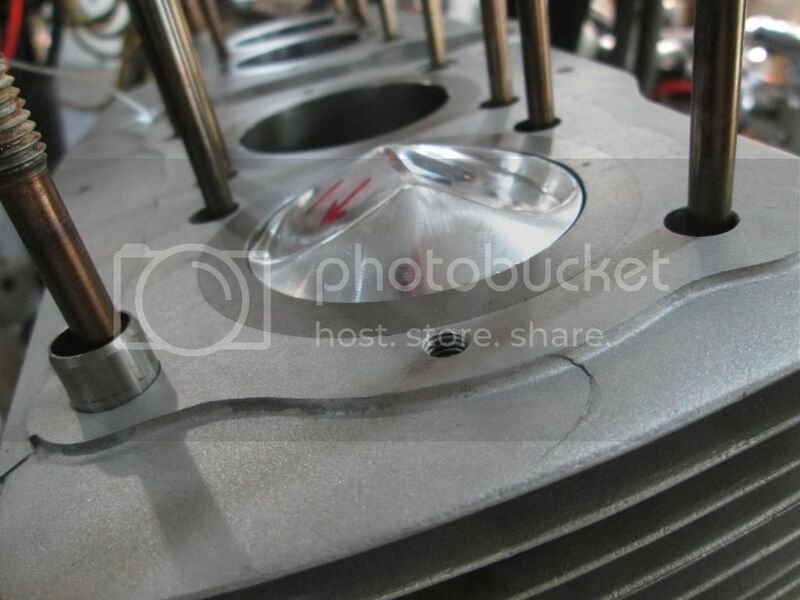 Can't wait to see those pretty pistons dirtied during tear down at inspection! Stock studs..........with HD nuts. 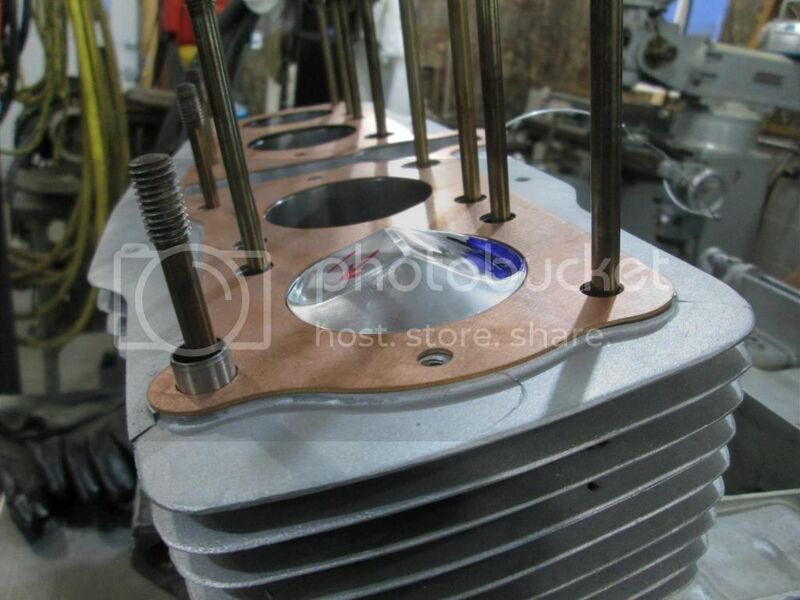 Dave prefers the machined stud so the stretch is not entirely on the threads..........until you get super compression requirements...........fuel......NOS......blower........supercharger........big pistons........ = heavy duty studs. Some news..............along with lots and lots of little things that take more time than they should. In another day or two the chassis will be complete and the paint will be drying by next week...............the motor needs some final few thou of adjustment to maintain proper piston to outer-edge of chamber clearances..........but the bottom-end is torqued and the valve to piston-pocket clearance is good. So today the chassis was stripped for final welding and finishing before it gets a coat of RED paint. Dave will do the paint and hang the frame in my enclosed trailer to 'bake' for a few days. Some work is still needed to finish the gas-tank and air-intake system before the oil and gas-tanks and seat go to the painter. 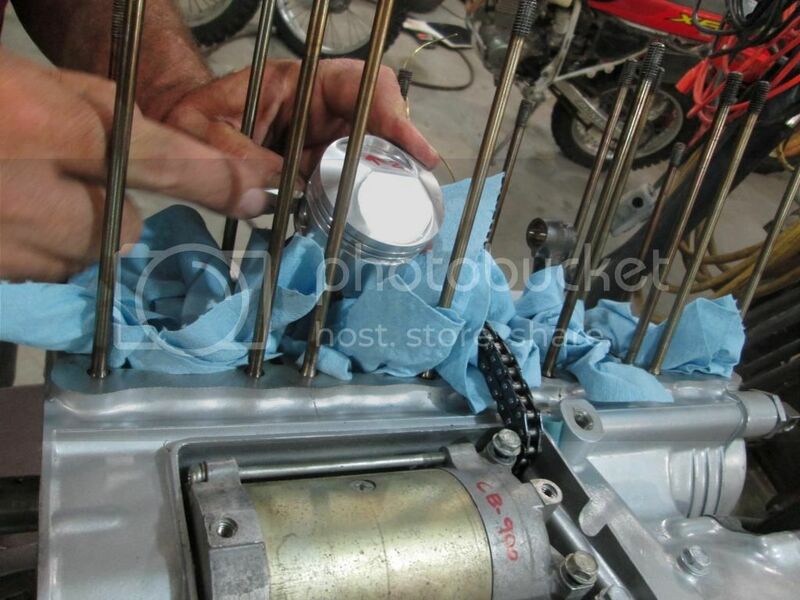 He will apply silver paint with enough hardener to protect the finish from fuel and tape-residue. The basic motor is assembled and bolted into the frame After re-torquing, the cam-tower will be assembled and the dial-in and timing will begin. We decided to use the original 1st-year-only 750A left-front motor-mount, with a shim for strength. One of Frank's (754) alloy units fits on the right-front. 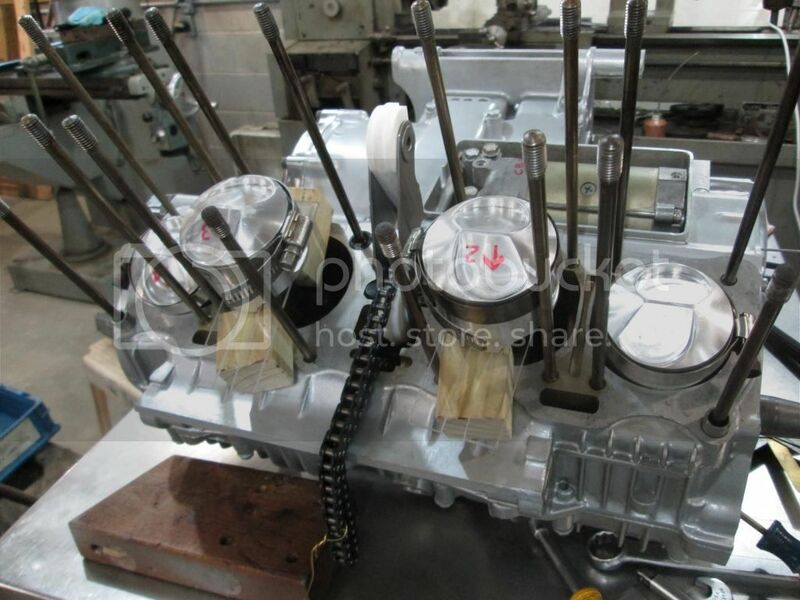 We encountered a few obstacles..........including switching piston-pins to stock HONDA units and having to machine about 20-thou from each end to get clearance for the clips in the Old-School J&E pistons. 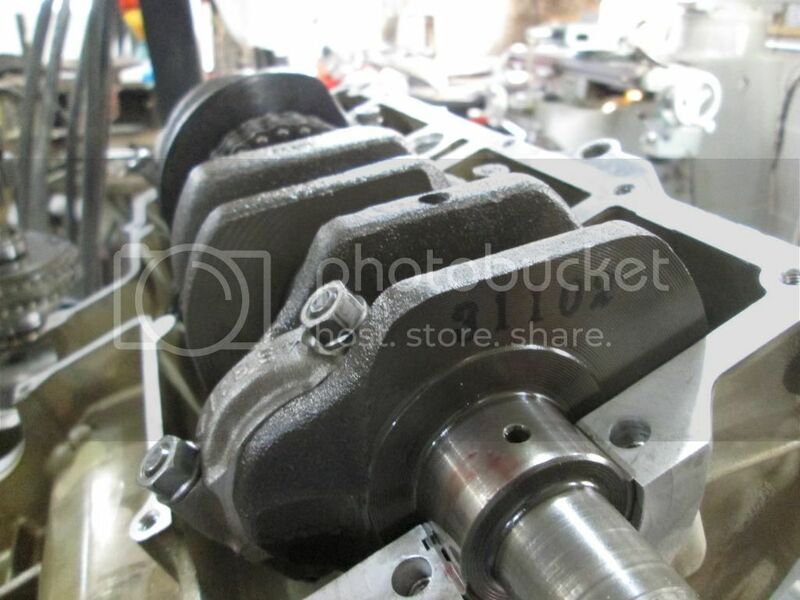 We turned the motor by hand and felt one piston encounter the edge of the head-gasket........but only on that one try. 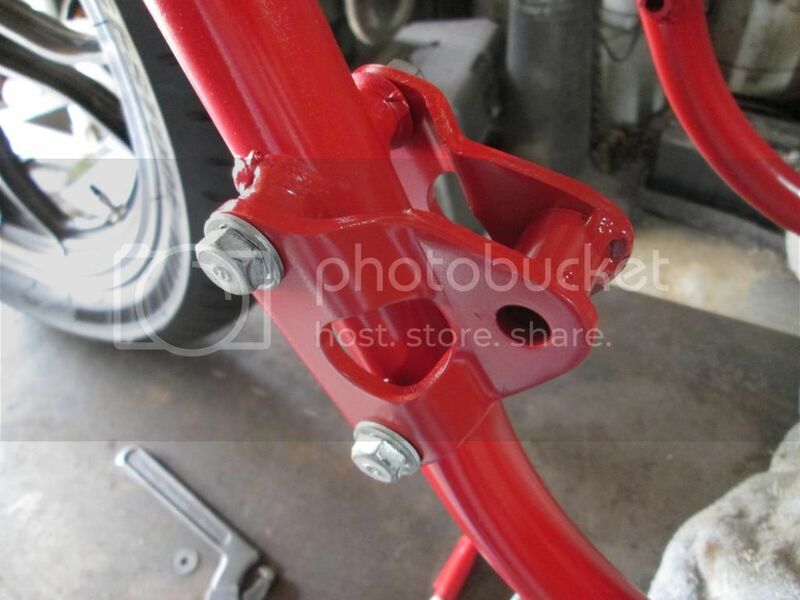 We think we have only one small part to fabricate for the front fender mount............all else is assembly. The painted parts should be back in time to install after the first bench-run. So that means we will have a full week to break the motor in before we leave for the Bonneville Motorcycle Speed Trials. So far so good Den ! I am a bit of a fan of bright red and polished alloy look. Get those pistons right Den , dont stress about the enth amount of compression as wont make big difference overall, but if something hits or detonates ask me how much damage can happen. Once again lookin good man. 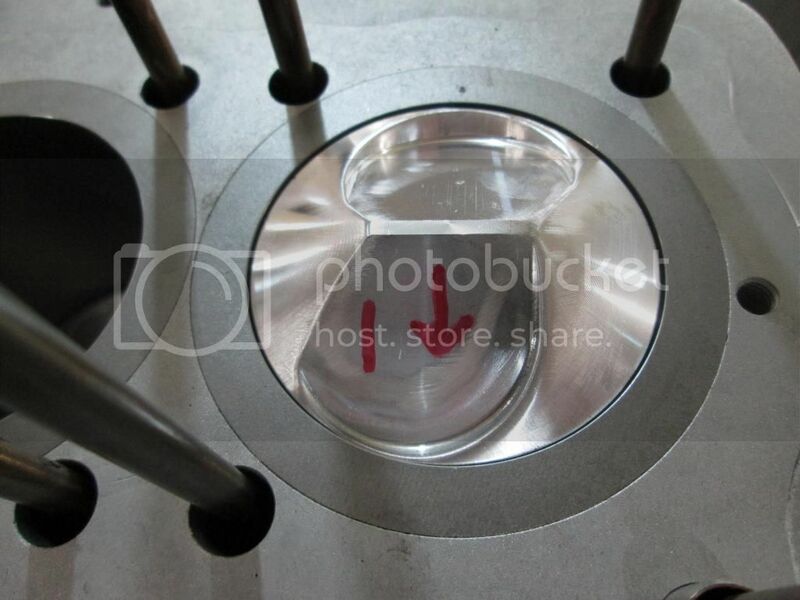 We measured piston to chamber clearance by setting the head-gasket on the head while lying on the bench. 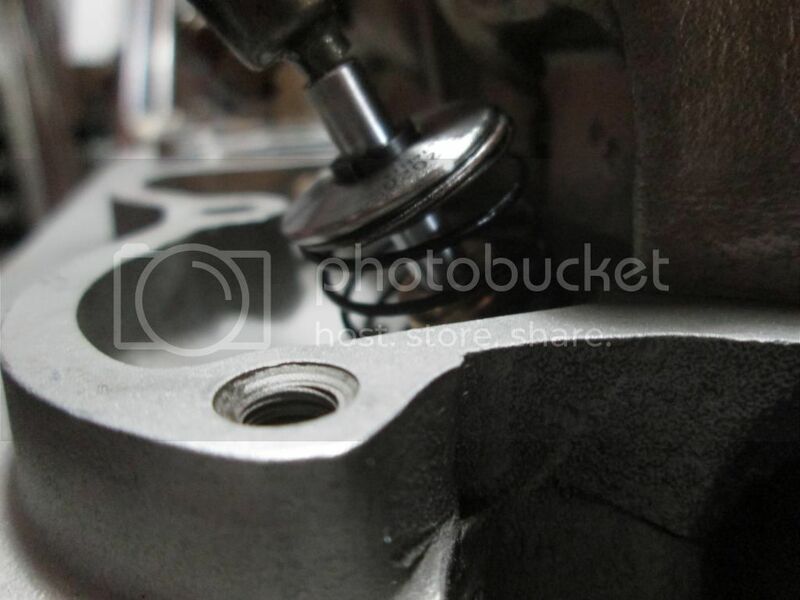 We aligned a piston into the gasket and measured the skirt depth. 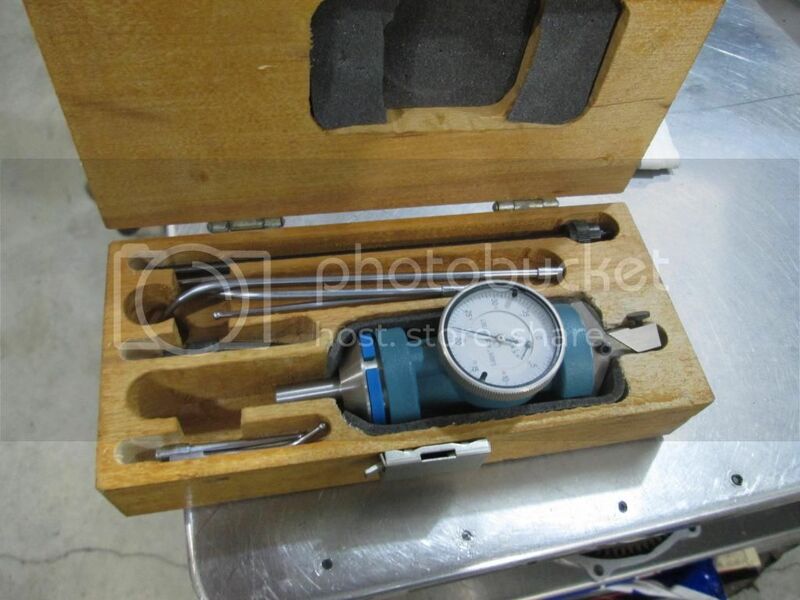 Then we inserted the thinnest feeler-gauge from the edge between the gasket and the head.......and again measured the piston skirt depth while resting the outer edges on the gauge. We have more than 30-thou clearance at the edge and it progressively increases as you move away from the edges. 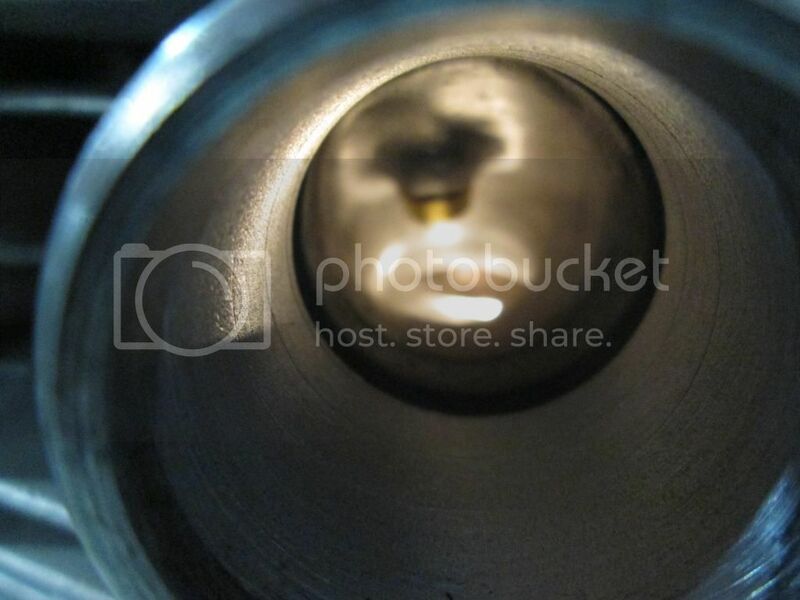 The clearances at the valve are substantial with minimal shrouding. Because this chamber design is more of a hemi-style than the K-head, the plugs have clearance without relieving the pistons. Dennis, way to go! You've been busy. Too much on my plate for this year! I need to slow my road for a little while! Bill Good Luck! Looking good, now just a little story. Three years ago during the last race of the season my pistons just kissed the head when it revved past the limiter to nearly 12K at the end of the straight each lap. There was an average of 0.035" clearance. It didn't do any damage but I got the message. 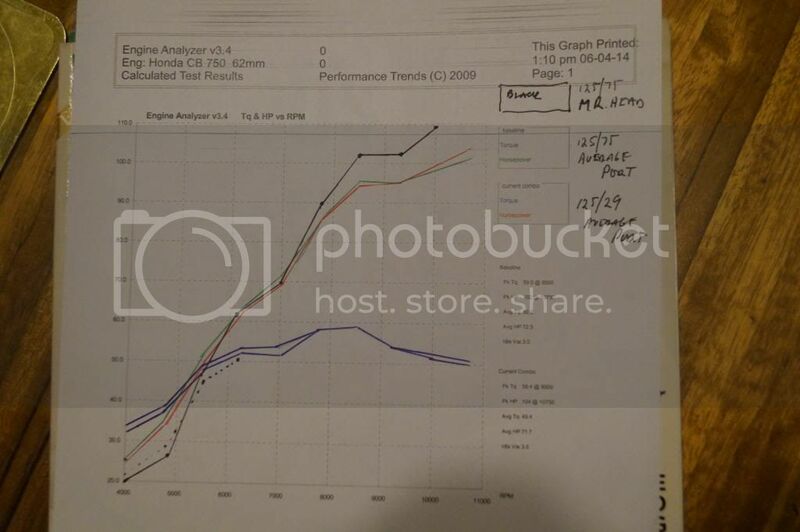 This was with stock rods/and 750F bolts. I switched to Carrillo after that on advice from a certain Mike fellow. He expected that much stretch was possible. I don't mean to be an old poop just sharing an experience I had. B.........Thanks for the advice and experience. The rods are stock.......but not from a CB750..........and if I see anything above 10,500 rpms before the return run for the record.............well...........that just means we went a little faster than expected. I sure didn't mean to sound negative Dennis, 0.030" is tight...but tight is also what you want. Glad you guys are all over it. Good luck, we're all rooting for you. 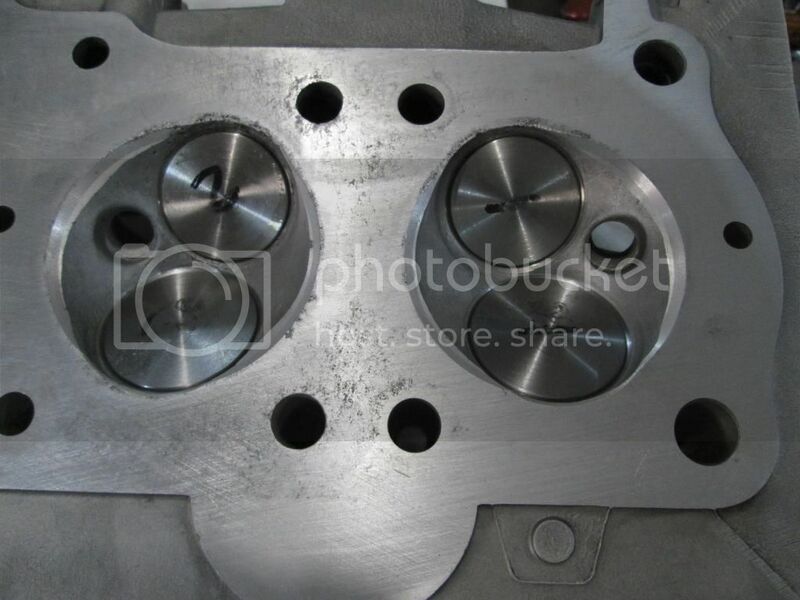 Gonna see you guys out there,got some new pistons i had made being bored into cylinder this week,assemble next week,on top of helping out my clowny friends who wait till the last minute like me,lol. I'll bring THE banner and maybe even Godzilla v1.0 Make this a true SOHC4 event.